Smart Choice Dental believes in providing our patients with the most comfortable dental experience possible. Because of this philosophy, we have invested in the most recent state-of-the-art technology to limit the amount of time you spend in our dental chair and to help educate you so you can make informed choices about your treatment. Our intra-oral camera gives a magnified view of your teeth so you can see what the dentist sees! One of the instruments we use is an intra-oral camera. Using this camera, we are able to see – and to show you – images of your teeth and any signs of decay or explain necessary treatment. How Does the Intra-Oral Camera Work? 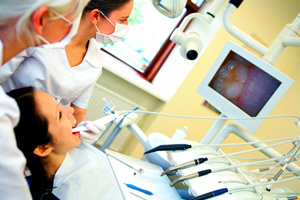 The intra-oral camera is a small, pen-like instrument used to capture images inside your mouth. It is covered with a sterile sheath, much like a thermometer in your doctor’s office, and it is completely safe and sanitary. The camera magnifies all surface areas of your teeth to help us locate specific problem areas that may indicate decay, cracks, or restorations that need to be repaired or replaced. The images captured by the camera are immediately available to you and the doctor via a chair side monitor. What are the Advantages of Using an Intra-Oral Camera? The ability to magnify images so that we can see even the smallest areas of all tooth surfaces to identify and problem areas. The educational advantages for the patient to be able to see exactly what the doctor sees, in vivid detail, in order to understand the conditions that are present and to actively participate in recommended treatment options. The ability to provide the results of a patient’s current dental hygiene so they can learn better ways to care for their teeth and improve outcomes. Incorporation of the images as part of the patient’s permanent record for necessary future reference. The ability to display “before” and “after” images so we can discuss appropriate treatment options for specific conditions. Facilitating insurance pre-approvals of treatment plans because patient images can be sent for condition verification. At Smart Choice Dental, we welcome an opportunity to demonstrate our intra-oral camera and other state-of-the-art dental equipment. Give us a call to schedule a pre-appointment visit to learn more about our practice and the ways in which we can make your appointments safer, shorter and more productive.